A guide to new services for aging in place. With longer life spans and aging baby boomers, the growth of today’s senior population is unprecedented. According to the Centers for Disease Control and Prevention (CDC), by 2030 older adults will account for roughly 20 percent of the U.S. population. 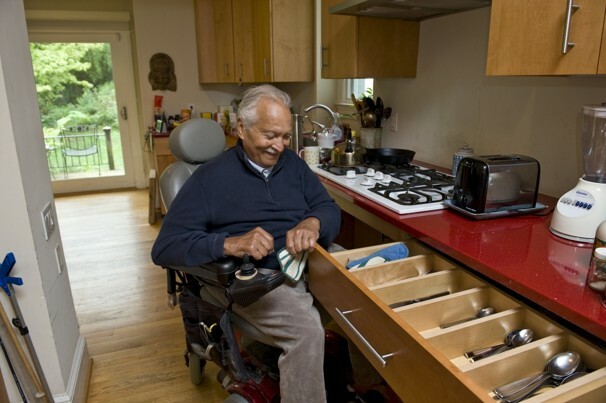 This dramatic growth in the senior population, many of whom will develop temporary or permanent disabilities, brings challenges for the medical, technological and home health care communities, one of which is keeping people in their homes as long as possible. It’s important for people to be as independent as possible as they get older. This is crucial for overall well being and health. It can also save the overall health care system millions of dollars. Fortunately, innovation is fueling solutions that provide help and support to people with disabilities and their caregivers. These technologies keep them safe and connected, and help them remain independent and in their own home. An estimated one in three adults age 65 or older fall each year. Medical Alert services empower people to live independently, knowing they can get help in the event of a fall or emergency. Products can come equipped with automatic fall detection technology that sense a fall and activate a call for help even when a person may be unable to do so. Newer devices offer wireless options and location technology, allowing people to travel outside their home with confidence. There are also mobile response apps available through smartphones and tablets. Health care professionals are turning to innovations to effectively transition patients from hospitals back to their homes. This kind of home monitoring allows health care professionals care for people remotely while they recover in the comfort of their own home. One in ten senior hospitalizations are related to medication management. Many people are taking a number of pills to treat a host of chronic and other medical conditions. Keeping track can be a challenge; even one mix-up can be dangerous. There are many tools to help, some as simple as plastic pill organizing boxes. By 2017 more advanced mobile apps will be a $30 billion market with tech that sends a reminder when it’s time for medication, and automatic devices that dispense presorted medications at preprogrammed times. Email, social media (Facebook, Twitter, Instagram) and Skype can help people stay active, engaged and feel less isolated. These solutions help seniors stay in touch with family and caregivers, particularly those who are distant, and provide easy access to information about health, medical and lifestyle issues. Although some people face barriers when it comes to using technology, including challenges learning how to use new devices, once they join the online world, digital technology becomes an integral part of their daily lives. As they become increasingly comfortable with Internet-enabled solutions and new waves of Web and social savvy baby boomers join the senior population, they will demand solutions that connect them to the people and information that are vital to their lives. These are just a few examples of how today’s innovation technologies are helping people the remain independent and safe. Continuing to innovate and offering the most connected and personalized solutions will help people navigate today’s complex health care system while increasing quality of life and lowering costs overall.